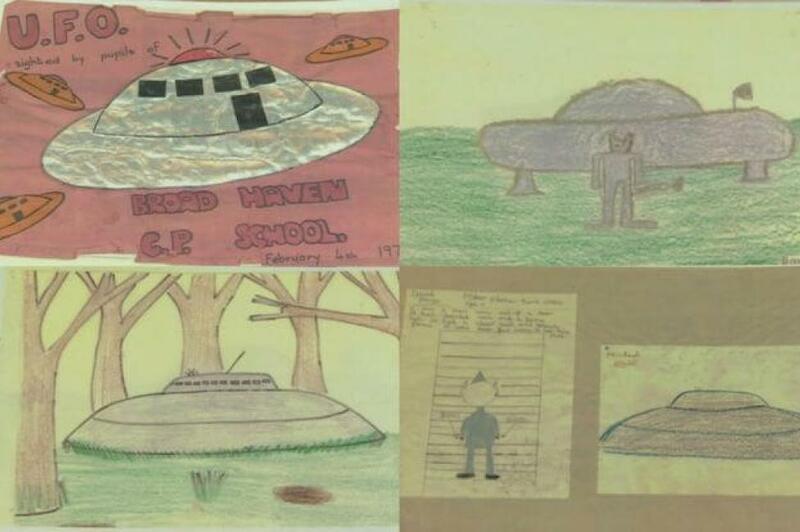 Forty-one years ago, a full sixteen before the first episode of The X-Files, a class of schoolchildren saw a UFO. The craft landed in a field behind their school, interrupting morning break. Broad Haven is as picturesque a UK coastal town as you could imagine. It may not possess the golden sands of more exotic regions, but at low tide the bay opens up a huge space, meaning you need never be bothered by a neighbour’s umbrella or Spotify playlist. For such a pretty place, Broad Haven remains remarkably undeveloped. The seafront hasn’t much changed since the intergalactic 1970s. This might be because of the location — it’s as far west as the British mainland goes. It’s two hours from Cardiff, the Welsh capital, and four and a half from London. I was there in April 2018. Now that I have two children, I possess neither the money nor the inclination to travel abroad. In the last couple of years, we’ve visited all the usual places: the Lake District, the South Coast, Cornwall. I discovered all this during a quick Google on the Broad Haven beach. My kids played chicken with the tide. My wife took shots for Instagram. And I was desperate to know why a camera crew filmed a green motorhome covered in ‘The Unexplainers’ decal. In the 1970s, the area was the scene of alleged UFO sightings and nicknamed the Broad Haven Triangle in the manner of the Bermuda Triangle, from a headline in The Sun that said Spaceman Mystery of the Terror Triangle. Wikipedia was quick to explain why a paranormal podcast might be interested in the area. I beckoned over my eldest son. “They were probably lying,” he replied, running back to the surf. The headteacher of Broad Haven primary school suspected this too. After he’d calmed the kids down, he separated them. In examination conditions, he asked the children to sketch what they’d seen. He was amazed that their drawings were all remarkably similar. A skeptic, like my son, might suggest that 1970s kids were familiar with the classic flying saucer shape. And, anyway, if photographs taken around the time were anything to go by, the pictures weren’t all that identical. To this day, the schoolchildren are adamant that they saw something. At the time, their frustration at not being taken seriously led to a petition being handed into the local police station. During my visit, a group of teenage boys sat on the grass verge that separated the beach from the road. They drank cider from cans and shouted at passersby. They looked like they’d benefit from the excitement of a UFO landing. It would distract them from the endless banter. Some other kids, younger than the cider drinkers, had been pestering the podcast crew in the same way you read of UFOs bugging fighter planes. Only these kids were after YouTube-worthy footage — you could smell the desperation for a stranger’s lost temper. I didn’t hang around to see if they got their wish. The sun was setting and my sons were soaking wet: it was home time. A triangle demands three points. Although the Broad Haven event remains the most famous UFO sighting during this time, it only marked the start of further strange happenings in west Wales. … sightings of UFOs from their car; a 7-ft silver-suited being with a black visor appearing outside their window; constant mechanical disturbances, including their car and television set repeatedly breaking down and having to be replaced; and their cows seemingly being teleported from one field to another! I’m no psychologist. I’m not a paranormal investigator either. But it strikes me that such reports would be more believable if corroborated by an independent witness. Here’s a family making otherworldly claims, following that of a class of schoolchildren. Groups bend individuals to a corporate view. Another witness did come forward. She wasn’t present at either the school or the farm but she did experience something strange. Rose Granville owned the Haven Fort Hotel, situated in Little Haven, a few miles along the coast. One night she claimed to have seen a saucer-shaped craft land in the hotel’s grounds. Humanoids in white boiler suits wandered around for a while. She ran off to summon witnesses. On her return, the craft was gone. During our holiday, we stayed near St David’s, where every civic sign proudly notes its status as Britain’s smallest city. It resembles a village with the attractive shops and cafés you’d expect from a tourist destination. It also possesses a huge medieval cathedral, which is what gives it its city status. The drive from Broad Haven traced us along the steep cliffs of Pembrokeshire. The views are dramatic, the granite cutting into sudden water, the land stretching out slivers of rock towards the islands that hug the Welsh coast. Somewhere distant is Ireland. Somewhere even further is North America. We passed a home that had been dug out of a cliffside field. My wife, proud of her knowledge, said the place had its own Wikipedia page. In truth, I focussed more on my phone than the scenery. I wanted Broad Haven closure. I wanted answers. Cowan blamed a local prankster. Thinking of the bored teenagers I saw on my visit, it made for a convincing explanation. Remember too — this was before the internet and social media. What else was there for kids to do but pretend to be aliens? Indeed, in 1996, a local newspaper reported a confession from Glyn Edwards, a 44-year-old businessman. He admitted to wandering around the area in a silver suit during 1977. His motivation for doing so, aside from the LOLs, was not revealed. Case closed? Maybe not. At the time, the Ministry of Defence wasn’t satisfied. They conducted their own discreet investigation. Documents released in 2015 show the MoD asking the RAF’s internal police force explore further. The MoD representative was concerned by the number of “level-headed” witnesses. The eventual findings have not been published. Two years ago a former US Navy sailor came forward to say that the cause of the silver-suited being was in fact a US military personal wearing their standard fireproof uniform and the UFOs were new Harrier jets being flown. Our AirBnB was a converted barnhouse in the middle of the Pembrokeshire countryside. Having stopped at a supermarket on the way home, we arrived back to pitch darkness. Living in the city, you forget how dark it gets. After a glass of wine, some dinner, and a little telling off of my youngest son for scratching his brother, I went to bed. Details of the day’s Broad Haven Googling flittered through my thoughts. The silence of the night was only broken by the occasional screech of a distant bird. This was no song, it sounded like a scream. “They were probably lying,” he’d said. But it’s a lie that continues to fascinate people forty years on.